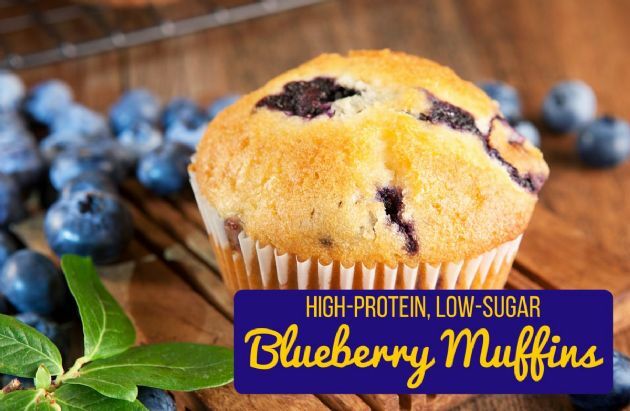 Just one of these muffins packs nearly 9 grams of protein! Pack one of these sweet, moist and delicious treats in your gym bag for a post-workout snack. Just one of these muffins packs nearly 9 grams of protein! Pack one of these sweet, moist and delicious treats in your gym bag for a post-workout snack. Note: I used wild blueberries, which are smaller, so I didn't thaw them. With regular blueberries, remove them from the freezer an hour or so before you plan to use them. You can also swap half of the whole-wheat flour for oat flour, which you can make yourself by placing oats in a blender until they form a powder. Combine the soy milk and vinegar in a glass measuring cup, then stir and set aside.